Yes, I am Team E-book. It's been debated furiously for years, with adamant fans on either side - which are better, e-books or real books? Why have e-books moved to front and center in my reading life over real books? - I am a terrible DEVOURER of books. You know how there are some people who take their time eating a delicious meal, savoring every bite and enjoying the dining experience? I'm the total opposite of that when it comes to books. (Ironically, I AM a slow eater though.) I love to slam through books and then immediately start in on the next book in the series (or on another book by the same author) and just completely consume them until I'm sitting in a puddle of my own feels, fighting a major book hangover. 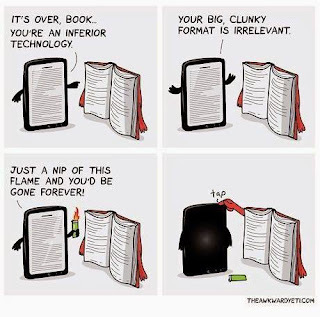 Having a e-reader makes it SUPER easy for me to do that. With real books, I have to have the foresight to order the entire series ahead of time or I have to sit there impatiently, burning and burning until either I get a chance to go to the bookstore or Amazon finally shows up with my delivery. - Speaking of less waiting, this might be Amazon-specific, but when I preorder a book in Kindle format, it actually shows up on my device the night before the official release date, around 9pm (because I'm on the West Coast, and therefore, it's technically tomorrow on the East Coast). For books that I have been hotly anticipating for a YEAR (like the upcoming third book of Sarah J. Maas' ACO series), this is huge! When I preorder a physical book from Amazon, they do have guaranteed release-date delivery, but 1) sometimes UPS doesn't deliver the actual package until later in the evening, and 2) sometimes there's a delay, and it doesn't actually arrive on release day for whatever reason (and I pretty much lose my s*** over it). - I have a bad tendency to change my mind about what I feel like reading at any given moment, and it's hard to carry around as many physical books, especially when I don't quite know what I'm in the mood for. - This is also Kindle-specific, but I love that a lot of my Kindle books are synced with my Audible audiobook files. (Sorry, this post sounds like one huge advertisement for Amazon. I promise you that I'm not being paid or sponsored in any way. Though if they offered, I probably wouldn't refuse.) I like listening to audiobooks while I drive, and it's nice to be able to switch between audiobook and e-book and have each one pick up where I left off with the other one automatically. Also, with some books, if you've already purchased the e-book, the audiobook is offered at a super-discounted price. Score. - This is a mere convenience, but I like finding all the quotes I've highlighted in one place afterward. 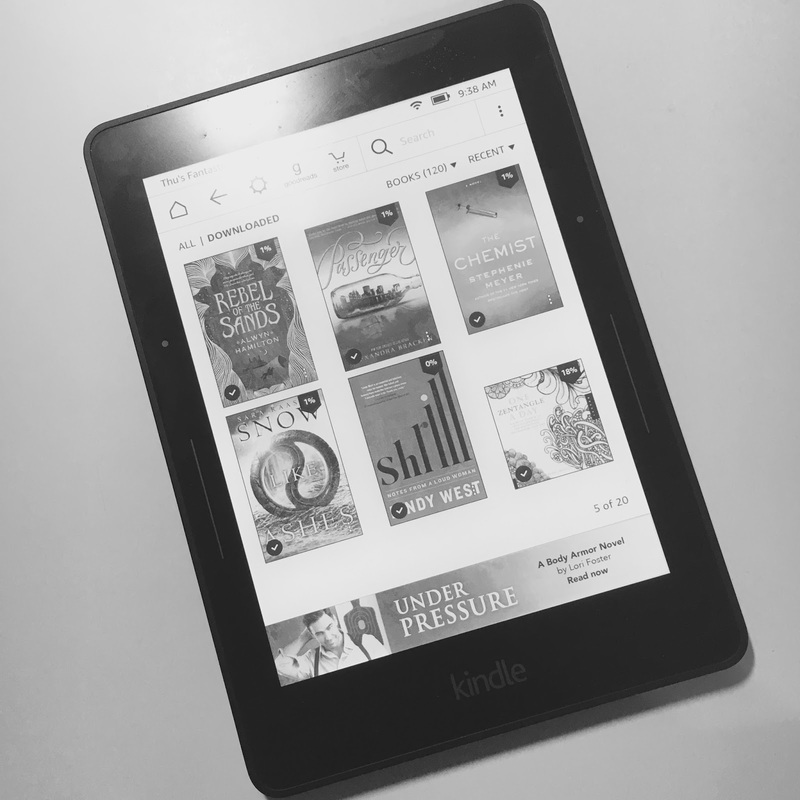 - I also really appreciate e-book sales, and with websites like BookBub, which sends me daily emails about cheap e-books, and especially with my Kindle Unlimited membership, I can often find books to read for very, very cheap (or even free!) And yes, I know, I could also just go to the library, but I like being able to read without a deadline looming over me. I'm not saying that e-books rule all things and that we should all convert. I definitely have a love for real books for many reasons (here's one), and nothing will ever make me want to get rid of my bookshelves full of books, but in terms of what works best for me in my life, I'm generally going to reach for my Kindle more often.